Even though there is much anticipation of spin-off commercial real estate development surrounding the new Veterans Administration and LSU hospitals on Tulane Avenue in New Orleans, there will be no doctor’s clinics constructed, no medical offices and no lab testing facilities built to replace the vacant lots and blighted structures. This article details the hospital developments on Tulane Avenue and why the changing business model that hospitals have today eliminates the demand for commercial real estate development. The Veterans’ Administration has agreed to rebuild its hospital facility adjacent to a new University Medical Center, which replaces Charity Hospital, and is operated by LSU. The VA’s new hospital, offering 200 beds is to be built between Tulane Avenue and Canal Street in the area bounded by South Galvez and South Rocheblave Streets, while the new LSU Hospital is expected to contain 424 beds. 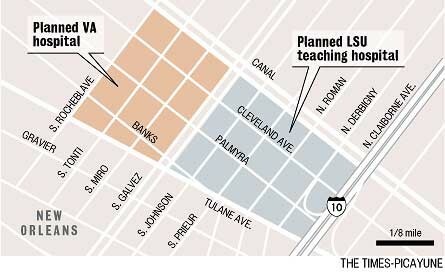 The LSU site fronts Tulane Avenue and Canal Street between South Galvez Street and South Claiborne Avenue, and is projected to open in 2015 with the VA facility to follow shortly thereafter. Both developments total $2.4 billion, making them the largest hospital developments in the United States. The 30-acre campus for the Veterans Hospital will contain 1.7 million square feet — about 70 percent larger than Charity Hospital — with outpatient exam rooms, 200 hospital rooms, 20 intervention and surgery rooms, an emergency department, a research facility, rehabilitation services and a mental health division. The hospital is slated to employ 2,200 people with an average salary of $95,000 annually. The new University Medical Center will replace the 68-year-old Medical Center of Louisiana at New Orleans, which closed following Hurricane Katrina. This new $1.2-billion facility will include a 560,000-square-foot, 424-bed inpatient tower, an adjoining 746,982-square-foot diagnostic and treatment pavilion, an adjacent 254,765-square-foot ambulatory care pavilion and support structures including a 546,413-square-foot, 1,346-car parking structure. One of LSU’s objectives is to build a brand and capture market share by treating heart and cancer patients who now are treated in Houston and other highly regarded specialty facilities out-of-state. With two large hospitals being developed, there is much anticipation by current property owners and speculators for additional developments to sprout up on Tulane Avenue, ranging from clinics so doctors can see their patients to laboratory and testing facilities. None of the developments will occur however, because the business model for hospitals has changed. Hospitals now want control over their doctors. Dr. Steve Nelson, dean of LSU School of Medicine, noted in a recent speech that hospitals now conduct their business differently in their relationship to doctors who have rights to send patients to the hospital. One example is the clear absence of clinics and doctor’s office surrounding Oschner Hospital on Jefferson Highway. There is no need for additional buildings to house a doctor clinic because that service will be provided on the hospital site. The new LSU Hospital will be a teaching hospital and academic medical center with doctor’s clinics an on campus building; therefore, there will be no demand for any additional facilities on Tulane Avenue. There will be a need for retail stores to satisfy demand for shopping, and for restaurants and hotels. However, there may not be demand for commercial real estate that results in a new Veterans Avenue. Both hospitals will house their own retail space including restaurants and stores for shopping. Just because there is a new development doesn’t mean there will be a flurry of shopping centers. Just look at the surrounding demand for shopping and restaurants around Ochsner’s biggest campus on Jefferson Highway. There are only three nearby restaurants off campus: a Subway, a Dot’s Diner, and a Piccadilly. In addition, a large proposed condo development never got off the ground, and a nearby shopping center failed to have enough demand to stay open. There is hope for a new hotel in the Tulane Avenue area, but it will be on the hospital site. LSU is currently negotiating to develop a hotel on the campus to handle housing for families of patients. Speculation is whether there will be a need for condos and housing for all the new high income hospital employees. Where will they live? Same place they now live: in Uptown and old Metairie.